From the woman known to some of the most famous bands in the world as the “Rock n’ Roll Doctor” comes a holistic prescription to achieving health and balance—even when you don’t live like a saint. 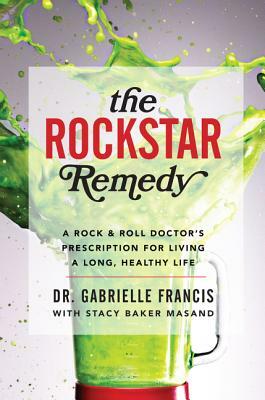 As a holistic practitioner and therapeutic masseuse to the music industry's elite, Gabrielle Francis has helped famous rockers to repair, recover, and refuel from the demanding schedules and occasional overindulgences that come along with the rock star lifestyle. Now for the first time, Gabrielle shares her sought-after, insider secrets with readers everywhere. Because being overscheduled, sleep-deprived, on the road, or occasionally eating or drinking to excess aren’t lifestyle habits unique to the music industry: they are the same challenges faced by all of us, every day. In The Rockstar Remedy, Gabrielle shares her unique strategies for boosting your energy and looking and feeling your best—even when your schedule doesn’t seem to allow it. She shows readers that their health exists on a spectrum, and the simple act of making better choices every day—even if they’re not the best choices—helps us achieve balance in both mind and body. With tips for improving energy levels, lists of foods to aim for and avoid, a simple no-starvation detox, and her popular “damage mitigation techniques,” which show you secret ways to reverse the damage causes by less-than-perfect choices, Gabrielle offers a simple, effective plan for staying healthy and happy amid the chaos of our daily lives. Dr. Gabrielle Francis has been practicing natural medicine for more than thirty-three years, while touring and working with the most famous rock bands in the world. A naturopathic doctor, chiropractor, acupuncturist, and massage therapist, Gabrielle maintains a thriving practice in New York City. Visit her online at www.theherbanalchemist.com. She is also the sole proprietor of Backstage Alternative, A Rock N Roll Natural Medicine Show, which provides natural medicine for performing artists on tour. Stacy Baker Masand is the cowriter of the New York Times bestseller Your Best Body Now and has written and edited for a variety of national women's magazines, including InStyle, Shape, Self, Fitness, Prevention, and many more.